Ocean Pines is a census-designated place (CDP) in Worcester County, Maryland, United States. The population was 11,710 at the 2010 census. 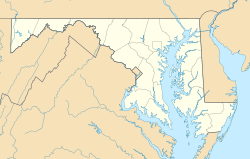 It is part of the Salisbury, Maryland-Delaware Metropolitan Statistical Area. It shares the same ZIP code as Berlin, Maryland. The community began as a small resort in 1968 and today is the largest residential community in Worcester County with a diverse demographic and award-winning reputation. Ocean Pines has its own police department, fire department, water system, public works department and many awe-inspiring amenities that are managed by the Homeowner's Association, Ocean Pines Association, Inc. (OPA). Ocean Pines Marina is officially re-certified as a Maryland Clean Marina. The statewide recognition illustrates Ocean Pines Association's continued commitment to clean marina practices and its dedication to the health of Delmarva's waterways. Ocean Pines Marina implements an oil recycling and oil spill response plan; participates in oyster gardening; executes proper staff training for fire, hurricane, oil and fuel emergencies; maintains a pump-out station and manages waste containment and proper disposal. DNR has certified nearly 25 percent of Maryland's estimated 600 marinas as Clean Marinas or Clean Marina Partners and aims to continue increasing this number moving forward. The certification demonstrates a high level of clean environmental achievement through knowledge, practice and active participation of the marina's staff, customers and subcontractors. Boaters can expect an elevated level of environmental awareness and responsibility when visiting a certified Maryland Clean Marina. Maryland Clean Marinas act to improve and maintain Maryland's waterways by reducing and eliminating releases and discharges of harmful pollutants, sediments, nutrients, general refuse and anything else that can damage aquatic environments. Ocean Pines Marina continues to take actions to reduce pollution and improve water quality in the bay, protect both fish and wildlife habitat and provide continued boating enjoyment for future generations. Ocean Pines Marina is open to the public daily from May through October. Ocean Pines Safety. A newly released ranking of the safest cities in Maryland for 2018 positions Ocean Pines at the top of the list. The study, which was conducted by the National Council for Home Safety and Security, reviewed the most recent FBI Uniform Crime Report statistics along with the population data and internal research. The crime rate study eliminated any cities that failed to submit a complete crime report to the FBI and removed cities with populations under 10,000. Ocean Pines has the lowest number of violent crimes and property crimes per 1,000 inhabitants, according to the statewide study. Ocean Pines has a state-certified, full-service police agency that operates 24 hours a day, seven days a week. All sworn officers attend 23 weeks of intensive police training at the Eastern Shore Criminal Justice Academy in Salisbury. Upon graduation, all officers are certified by the Maryland Police Training Commission. Featured by Forbes Magazine. Forbes Magazine, a leading source for business news and financial information, has named Ocean Pines as one of the top places in the nation to retire in 2017. Forbes presents an annual list of the top U.S. retirement cities and towns. This year, financial experts have crunched data from 550 communities and have chosen 25 cities, from 20 states, as the best places to retire for affordable, high-quality retirement living. The famed magazine describes Ocean Pines as a wooded waterfront community of 12,000 on Maryland's Eastern Shore with an above-average ratio of physicians per capita; good air quality, extremely low serious crime rate, and no state income tax on Social Security income. In 1984, Gerald S Klien bought $55 million in property for development using Merritt Commercial Savings and Loan assets including a $2 million Maryland Marine wastewater plant. Maple Lawn and Burleigh developer partner Stuart Greenbaum, purchased 800 additional acres for subdivision. In 1985 Worcester County commissioners condemned the Maryland Marine Systems Merritt Commercial Savings and Loan owned sewer system embroiled in the Jeffery Levitt Scandal in order to remove a development moratorium. The system had failed to implement $1.3 million in required maintenance to prevent sewer overflow into the streets creating the moratorium. Ocean Pines is located at 38°23′1″N 75°9′10″W﻿ / ﻿38.38361°N 75.15278°W﻿ / 38.38361; -75.15278 (38.383692, −75.152755). According to the United States Census Bureau, the CDP has a total area of 9.4 square miles (24 km2), of which 6.7 square miles (17 km2) is land and 2.7 square miles (7.0 km2) (29.0%) is water. At the 2010 census, there were 11,710 people, 5,471 households and 3,457 families residing in the CDP. The population density was 1,758.5 per square mile (597.7/km²). There were 8,870 housing units at an average density of 1323.9/sq mi (511.1/km²). The racial makeup of the CDP was 94.5% White, 2.4% African American, 0.2% Native American, 0.9% Asian, 0.7% from other races, and 1.2% from two or more races. Hispanic or Latino of any race were 2.4% of the population. There were 5,471 households of which 10.4% had children under the age of 18 living with them, 60.0% were married couples living together, 7.1% had a female householder with no husband present, and 30.3% were non-families. 25.3% of all households were made up of individuals and 14.4% had someone living alone who was 65 years of age or older. The average household size was 2.14 and the average family size was 2.50. 16.8% of the population were under the age of 18, 4.1% from 18 to 24, 15.4% from 25 to 44, 32.0% from 45 to 64, and 34.5% who were 65 years of age or older. The median age was 57.6 years. For every 100 females, there were 92.7 males. For every 100 females age 18 and over, there were 90.3 males. The median household income was $46,328 and the median family income was $76,123. Males had a median income of $51,489 compared with $42,261 for females. The per capita income for the CDP was $40,418. About 1.5% of families and 4.0% of the population were below the poverty line, including 5.0% of those under age 18 and 2.9% of those age 65 or over. ^ Marry Corddry (4 September 1985). "Ocean Pines sewers may be condemned". The Baltimore Sun. ^ "CENSUS OF POPULATION AND HOUSING (1790-2010)". U.S. Census Bureau. Retrieved 1 August 2011.